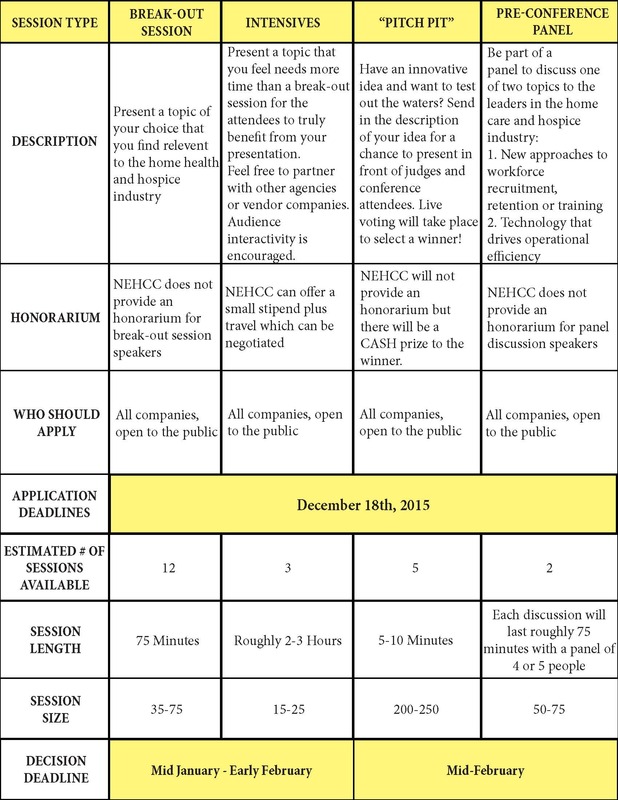 2016 NEHCC Call for Speakers Now Open! The Call for Speakers for the New England Home Care and Hospice Conference and Trade Show is now open with new opportunities to speak! The grid below provides detailed information about the different options available to potential presenters. The NEHHC welcomes Speaker Presentation applications from a diverse audience of home health and healthcare experts. All proposals can be submitted by clicking below and must be entered by December 18th, 2015 for consideration. This entry was posted in Speakers & Programs and tagged Call For Speakers, NEHCC. Bookmark the permalink.